1.0m (3'4") long Hampton Mini greenhouse with 4mm toughened safety glass, 2 tier watering system, 4 seed tray shelves and middle staging. 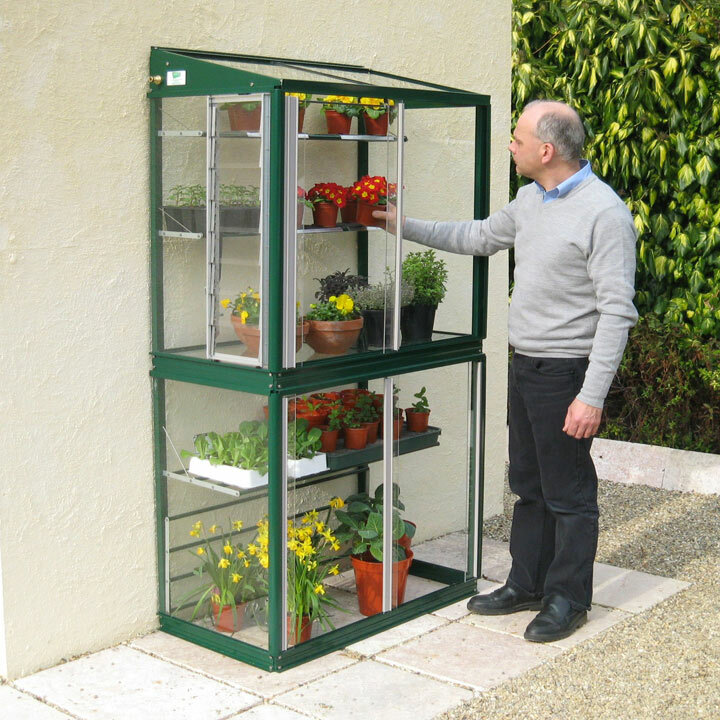 The Hampton Mini greenhouse is designed to fit against a wall or fence (an optional glass back is available for freestanding use). Wall and ground fixings included. Aluminium structure with 25 year framework guarantee. Toughened safety glass. Delivery to mainland England, Wales and southern Scotland included. Length 1.0m (3'4"), Height 1.76m (5'10"), Depth 0.53m (1'9"). The Hampton Mini greenhouse is shown with mist watering. Optional louvre vent and colour coating Racing Green. The framework is colour coated in racing green.